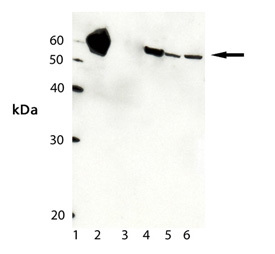 Western Blot analysis of HSP60 pAb (Prod. No. ADI-SPA-828) Lane1: MW Marker; Lane 2:HSP60 protein (human) (recombinant) (Prod. No. ADI-NSP-540); Lane 3: HSP65 protein (M. bovis) (recombinant); Lane 4: HeLa Cell Lysate (Prod. No. ADI-LYC-HL100); Lane 5: 3T3 Cell Lysate; and Lane 6: RK-13 Cell Lysate.